Exhibit A: the meltdown. All because I wouldn’t let him drown himself in Lonesome Lake. My bad. Hiking with kids is always an adventure. There’s a slippery slope between family fun and total meltdown (see Exhibit A), and believe me, when your child has a conniption in the forest, other hikers are around to hear it. The following tips are a recipe for happy trails on your next family hike, allowing you and yours to build lasting outdoor memories that everyone will be excited to do again. If there’s a peak you’ve been itching to bag, find a time to go without the kids. The measuring stick for a successful family hike is whether or not everyone had fun. It’s best to think of the planned destination as a suggestion, the odds of getting there a coin flip at best. As simple as this sounds, I’ll be the first to admit it’s by far the toughest to abide. This past fall my family set out to hike the Crawford Path up Mt. Pierce on a weekend when the temperatures suddenly dipped below freezing. It being October, we hadn’t bought winter boots for our son yet, but we decided to give the hike a go nevertheless. About three-fourths of the way up his feet got cold. Despite our better judgement, we tried to extend the hike by rubbing his feet and getting him moving. When this didn’t work, we made the wise decision to abort the hike and get a pizza. Fun was restored, disaster avoided, and he didn’t run screaming the next time we suggested hiking. Looking for hiking fun? Just add waterfalls. Pictured here is Angel Falls near Rangeley, Maine. Increase your chances of completing the hike by dangling a scenic carrot. With our son we often go “waterfall hunting.” Fire towers are also a big hit. If he knows there’s something he wants to see, the hike doesn’t seem like aimless wandering. It should also go without saying that the difficulty of the selected trail matches your child’s age and hiking ability. 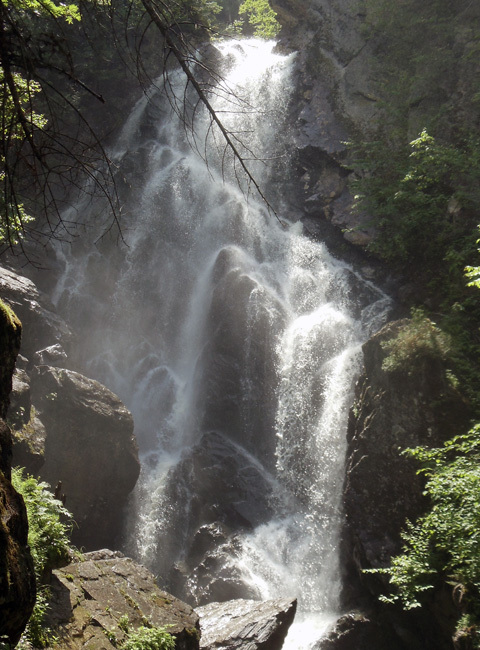 We have a modest list of family hikes here that are good for kids of all ages. 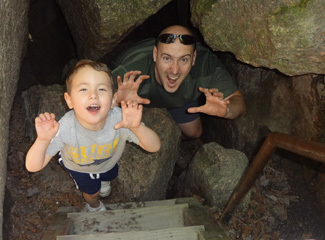 If you’re unsure where to take kids hiking, state parks are often a great place to start. 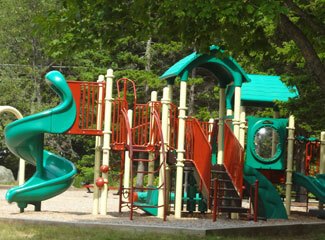 Some of these, such as Winslow and Bear Brook State Park in New Hampshire, even have playgrounds. Scavenger hunts are a great way to keep kids engaged on the trail. 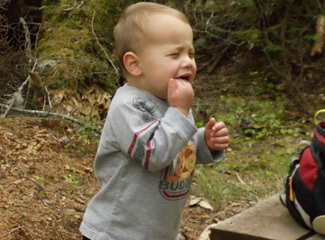 Making it a photographic hunt can also help teach little ones about low-impact hiking. Not to mention they’ll love manning the camera. We’ll often play another game where my son and I run ahead on the trail and “hide.” When Mom comes along we jump out and pretend to be bears. The trouble here, sometimes, is finding a way to end the game. So, you know, good luck with that. Every hike needs a strong trip leader. Someone with a keen eye for blazes (possibly even an ability to count them) and natural trail-following instincts, who can show any easily confused adults the right way to go. The successful candidate must be able to carry a map and compass. On the job training is available for both. The miles aren’t nearly as important as the memories. Wherever your family hikes lead, always remember: don’t feed the bears. Pack snacks. The real good stuff. Carrot sticks and apple slices are good…for school lunch. On hiking excursions, bringing special treats like candy bars, trail mix with the M&Ms, juice boxes, hot chocolate in winter, etc., can add excitement, serve as motivation, and create a positive association for the total experience. This isn’t to say you shouldn’t have any healthy options, and every outing still requires ample water for everyone. Watch the weather report. Then plan for anything. Yes, as kids get older, it’s important to teach them how to weather the elements. Until they reach this stage, however, heading out into rain and extreme temperatures is asking for trouble. Keep in mind that little toes, fingers, arms and legs get colder easier than their adult counterparts. Even when cherry picking a good day, prepare for anything. If it’s going to be hot, pack warm layers. When sunny, bring rain gear. Hikes with friends and other families will seem more like an adventure to your children, and less like Mom and Dad dragging them away from the television. I enjoy going on trips with kids older than my son as he’s more apt to hike longer and take on challenging terrain when he sees the other kids doing it. Pick your hiking friends carefully, though, as unruly behavior is just as likely to be modeled. Beware the trailhead playground. For meltdown prevention, it can give…and take. Maintain the routine. Or at least a reasonable facsimile. Your family likely has a routine for snack, meal and nap times. Getting outside the “safe zone” (give or take 20 minutes) for any of these ups the ante on your children flicking the switch from sweet and adorable to insufferable tyrants. The food part of the regimen is easy to maintain, and if anything you might want to satiate the little beasts earlier than normal to account for the energy burned hiking. Keeping the rest schedule can be tricky and may take some creativity. Try to plan travel to and from trails during nap times so the kids can (fingers crossed) sleep in the car. If you’re planning a full-day trail adventure (dear God what are you thinking?) after your kids have outgrown sleeping in the carrier, pack a blanket, or even a tent to create a “bear cave” for your little cubs to rest. Yes, it’s more weight for Dad’s pack, but it sure beats the alternative. Forget to pack the comfort item at your own risk. If your child is young enough to take comfort in a special blankie, stuffed animal or lovie, for the love of peace and quiet, don’t hit the trail without it. Bring earplugs. And a disguise. If you’ve got any other tips to avoid the final suggestion, please help a parent out and share them in the comments below.